Skimmer Plug - SIMPLE POOL TECHNOLOGY, INC.
​The Easiest Patented Pool Skimmer Closure System Available. The Patented Skimmer Plug™ offers a simple yet revolutionary method for servicing and winterizing above ground and in ground pool skimmers. A first of its kind, the patented Skimmer Plug™ is superior to any other skimmer closure or winterizing device on the market, being more affordable, as well as much easier to use. The Skimmer Plug™ fits all OEM skimmers without the need to replace the original skimmer faceplate. 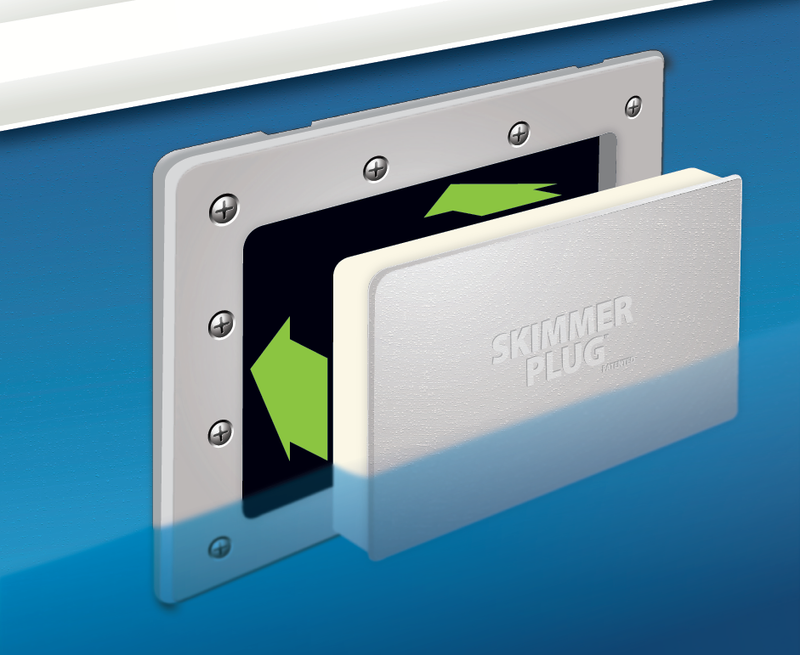 With no installation or tools required, the Skimmer Plug™ securely fits into the skimmer opening using our exclusive Rovaseal™ thermo insulated expanding layer to plug and grip the faceplate, creating a 100% air/water-tight seal. 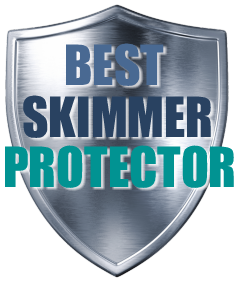 Ice is no match for the Skimmer Plugs rigid outer plate, providing a durable and secure layer of protection through the winter. ​Use with all automatic pool covers, fiberglass pools, vinyl liner pools, aboveground and inground, UV resistant, chemical resistant. We used several test tanks and allowed some of the tanks to freeze solid. Each test was for 120 days and all the skimmers where dry with no leaks or failure. 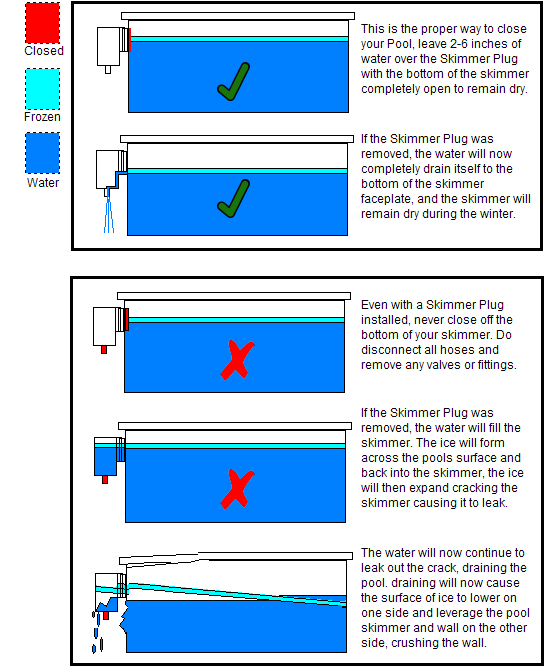 Tested with the water level inches above the skimmer faceplate was done to demonstrate that the plug is water tight even under extreme pressure, read the installation guide below about keeping your pools water at the recommended level for winterizing. Here we used a 16 oz. drinking glass filled with water turned upside down on a table top. 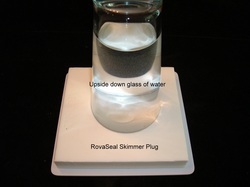 With only the weight of the glass our Skimmer Plug will still block the water from getting out. A glass of water has the same amount of hydro-static pressure as a pools skimmer. With the Skimmer Plug installed on your skimmer squeezed in place like a cork, it will now have even more pressure against the inside wall of the faceplate, so water never has a chance of ever getting back into your skimmer when winterizing or servicing your pool. 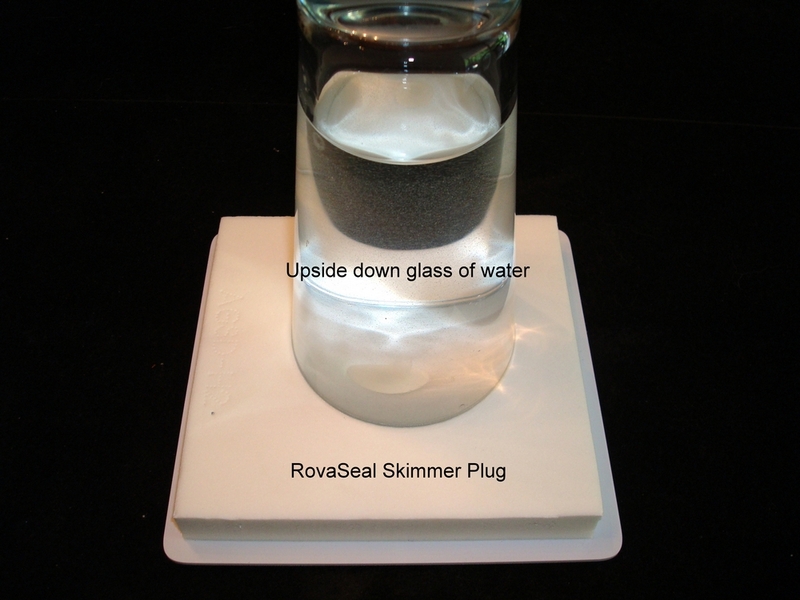 Once the Rovaseal™ foam is pushed back past the thickness of the faceplate, the foam expands out to hold it in place. Dip the Skimmer Plug into the pool water before inserting into the skimmer faceplate; this will help the foam portion of the plug more easily slide into place. If pool water is not enough, use O-ring lubricant on all the edges of the foam pad. O-ring lubricant will also cure a minor drip caused by possible mold defects or nicks in your skimmers faceplate. Aboveground pools should remove any hoses, valves or fittings that are attached to the skimmer. It is very important that the bottom of the skimmer remains open so any water that enters will quickly drain out. 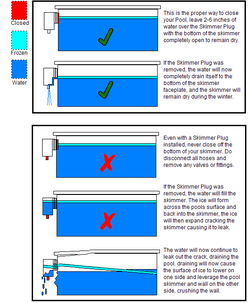 Once the Skimmer Plug is installed you should not allow water to get much higher than about 6 inches up from the bottom of the skimmer plug . This means you may need to monitor the water level in your pool over the winter months. If the water level in the pool rises due to a leaking cover, etc. excess water should be drained. If the water level in the pool becomes too high, ice can form above the faceplate; potentially causing damage to the pool. Do not leave your pool unattended all winter long. 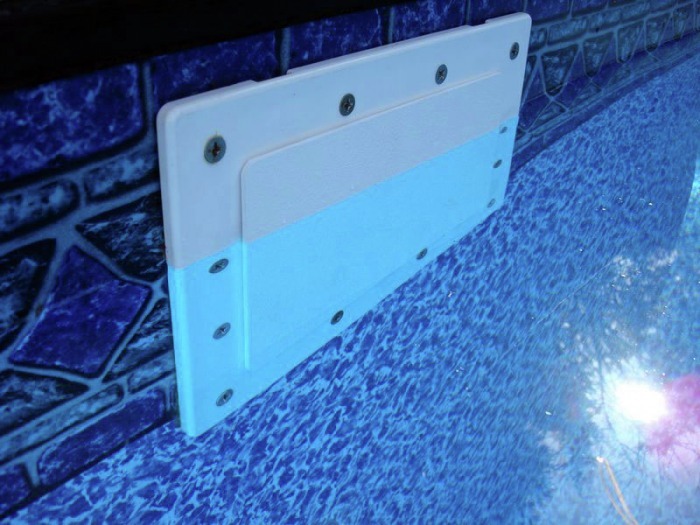 Periodically check the pool and fittings for any sign of leaks and to maintain the proper water level, which should be at the halfway point on the skimmers faceplate. A pool that is left up during the freezing temperatures must not be allowed to leak. A small leak that develops during summer usage often goes undetected, thought to be evaporation or spillage. Persistent wet area around pools should be inspected. To determine if your pool is leaking, mark the liner at the water level and closely observe the water level in the pool for a period of 7–10 days after the pool is closed for the season. If you experience any rain during this period be sure to compensate for the added water. If you notice a leak that cannot be stopped, release the tension on the winter cover immediately to alleviate additional stress on the pool walls. Failure to do so could cause damage to your pool. Removing excess snow and ice from the winter cover will also reduce stress on the cover and pool walls. PLEASE be sure to follow the winterizing recommendations of your local pool professional. They will know the climate in your area and offer the best advice to properly winterize your pool and protect it from freeze damage.